t*rexes and tiaras: Sincerely Louise Badger Scarf..
Normal service certainly seems to have resumed in my life. I feel a little bit as though I've been juggling all of the things this week, not *quite* managing to get anything finished. So, rather than show you any of the non-progress I've been making on current projects, I'm rewinding to something I made as a Christmas gift. 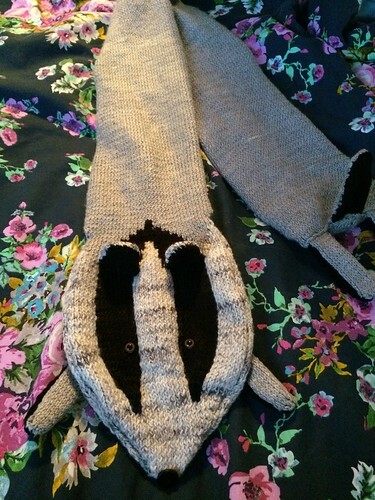 Unwisely, I decided about a month before Christmas that I would make a badger scarf for Alex, using the Sincerely Louise pattern. This is the second of her patterns I've successfully managed to complete - the first being the pterodactyl bag which I used to get back into knitting earlier in the year. I find them very easy to follow, as well as having such a range of lovely designs. I'd love to knit a tiger rug, but with nowhere to put it, I'll have to make do with living vicariously through Amy. It took me a little time to get to grips with intarsia knitting - having seven different balls of wool attached to the project when I was working on the face section meant that it wasn't a very portable project, but thankfully the last 400 rows or so were just the one colour, so I was able to take it with me on the train to London and on various car journeys, as well as endless evenings of knitting in front of the fire. Finally, I was able to cast off, sew up and add the eyes and the nose. Perpetual queen of last-minute, I may have wrapped this the morning that I was off to see her. Did you handmake any Christmas gifts this year? I'm sure you'll get around to it. I am STILL working on the baby blanket - shamefully! This is wonderful! Was it difficult to knit? I haven't tried any intarsia before, but this is tempting me to try. Not too difficult to knit. 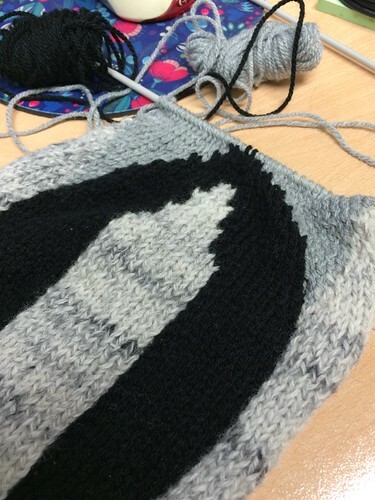 Keeping the colours untangled was the trickiest part for me, whilst doing the intarsia. I'm so in awe of your knitting skills!! I presumed you made me the wreath brooch and the angel decoration now from seeing this (wasn't sure if you had or you'd bought them) and I'm awe you can make such a variety of things-my presents were very clever and this too is amazing! You are a very clever person!! I have to admit, I bought those ones from a craft fair. I've only very recently picked up knitting again and I'm very slow at it. I'm currently knitting this scarf, your completed one looks so good! I'm also new to intarsia and finding the mix of wools a little overwhelming! Thank you - I found that I just had to go slowly and keep untangling the various different balls of wool. Thank you - it was worth it in the end!